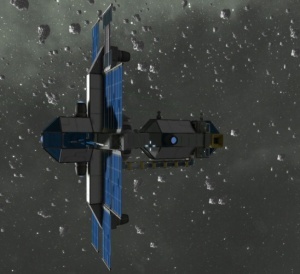 A Business Shipment is a solar-powered cargo ship with valuable cargo. This ship features two Interior Turrets, situated on the top side, opposite the exterior conveyor tube. They much like the Private Sail are relatively light guns and if engaged tend to run out of ammunition very quickly. This ship has no interior defenses. The specific antenna that spawns drones has a range of 311 meters and is named: "EMERGENCY - REQUESTING ASSISTANCE". This antenna within range will spawn a Assailant drone in defense, at 3000 meters away from the player and every 5 minutes up to a total number of 3 drones active any time. As both turrets are mounted on the top, above the cabin, approaching from the behind and underneath is a good way to avoid them. No attack is necessary, but has entertainment value. The ship has a single door at the rear of the ship, with the cockpit down a small corridor. If you wish to avoid the defenses, cutting a hole underside through the conveyor tube and rearmost Interior Wall gets around both the door and the guns. Difficult as ship has Batteries, a Reactor and Solar Panels. However one Interior Turret is fixed to a Steel Catwalk which is easily shot off or ground away from inside the cabin. There are four small cargo containers surrounding the exterior around the entrance. There's one large reactor at the front of the ship (you can't miss it). containing Uranium to fuel it. It is connected to the rest of the ship via a conveyor tube, so you don't need to access the reactor directly. As of v.1.045 (list), the Business Shipment has gained two Interior Turrets on the outside, and two Antennas on the front which then causes two thrusters to be relocated further back. As of v.1.030 (list), the new Business Shipment has a Collector, a Connector and an improved Conveyor system, . Everything is now connected to each other, even the formerly troublesome reactor. This page was last modified on 26 December 2016, at 16:19.